On April 5th 1996, Noel Gallagher appeared on TFI Friday the show was presented by Chris Evans and the interview was filmed in Chris' London home. On April 5th 2000 Oasis played at the Paramount Theater in Seattle, USA. Listen to the bootleg of the gig in the below. 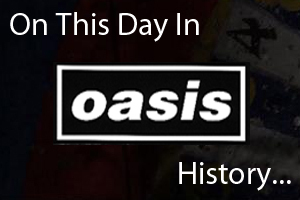 On April 5th 2009 Oasis played at the Singapore Indoor Stadium in Kallang, Singapore.